Yes it’s that time of year again – the weather is getting colder and everyone around you seems to have a serious case of the sniffles. You are way too busy at work and home to get sick right now. Oftentimes simply being busy is what makes you more susceptible to the pesky common cold. We all know that burning the candle at both ends is a no-no but today’s hectic lifestyles make it inevitable. So what to do when your ears and throat get itchy and you feel your body getting tired and weak? Sure you can run to the doctor’s office, wait 2 hours to be seen and leave with a z-pack or strong round of antibiotics that your body may or may not require. If your symptoms persist longer than three days or you have a fever, it is imperative that you see a doctor. 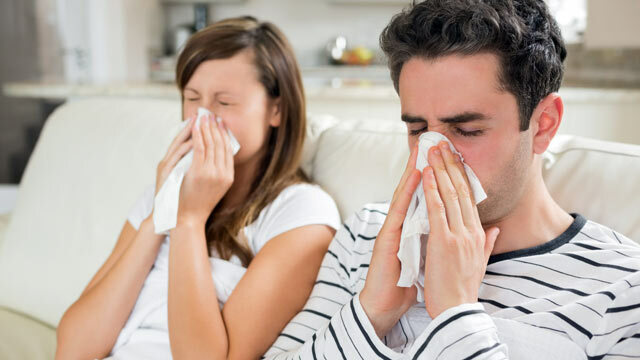 Yet at the first sign of a common cold there are many natural remedies that will help you boost your own defenses allowing your body to overcome that cold on its own. First things first, if you aren’t already taking a multi-vitamin stock up now and begin taking one daily. In addition, purchase a zinc supplement which will naturally boost your body’s immune system. Next, take a bath in Epsom salt which is a great detox known to pull toxins from the body. It will also work to soothe your achy muscles. If you are feeling congested, boil some water and then add a few drops of pure eucalyptus oil. Steam your face with the concoction to reopen your nasal passages. Now remember, nutrition can heal (or harm) your body. Enjoy some chicken noodle or vegetable soup. Just be sure it’s fresh and not canned. While all warm soups are soothing a homemade soup made with fresh veggies and broth contains many more nutrients and will be most beneficial in helping you kick your cold. Green smoothies made with raw fruits and vegetables also have extreme alkalizing and healing properties so be sure to enjoy one. Drink plenty of water with lemon to flush your system and provide it with a healthy dose of vitamin C. Adding 2 Tbsp of organic unfiltered apple cider vinegar (ACV) to the mix will also help your body kick the bug. Be sure to drink it with a straw as it can be acidic on the teeth. If you feel as though you’ve swallowed a razor blade, soothe that painful sore throat by gargling with warm salt water and feel free to add a splash of that magical ACV. When all else fails take a nap. Rest is exactly what your body needs now.